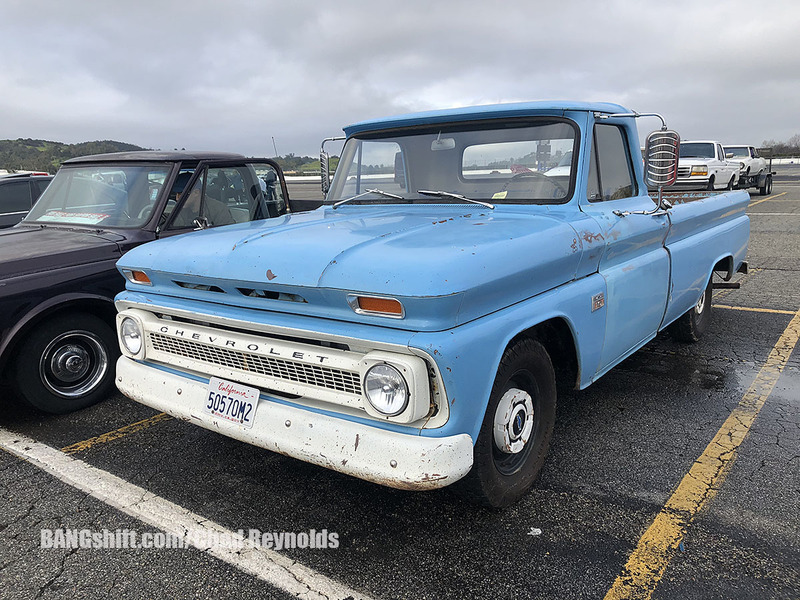 It was most certainly not the busiest Pomona Swap Meet ever, but that certainly didn’t keep us from having fun, scoring deals, and helping friends buy cars. The rain that had fallen the day before, and the mild threat of continued showers early in the morning, kept some away but not us. After picking my buddy Stephen up at 4:45 and heading to Crosby’s, we met up there with him and Jay and all jumped in to Jay’s dually to head out. We got to the Pomona Swap Meet before 5:30 and started walking rows of parts. Jay had his 1957 Chevrolet 210 on display and for sale, but it had a phone number on it and serious buyers would call. Since the crowds were small, the sellers were in a bargaining mood, especially for it being so early. We surmised that some of them were probably looking to make enough money to cover the price of their spot so they at least didn’t end up in the red. There are low prices, and then there are low prices. When we walked by a booth, and were paying little attention, Crosby pointed out a well preserved GearVendors overdrive unit sitting on the ground. It was covered in at least a quarter inch of dirt and oil, but it was most certainly a GearVendors overdrive that had the dash switch but no controller. I asked how much and was having trouble keeping my mouth shut when the seller said $250. It is a swap meet though, so I tried to haggle. The seller was having no part of it and finally said to me that I knew what it was and he knew what it was and that we both knew what it was worth. He was right. It is worth WAY more than $250 so I snatched it up and made it mine. There were a few other deals, including a cast iron Donkey that I REALLY wanted, but after doing some parking lot drinking I forgot all about him and left without my Donkey. Oh well. Next time. Check out photos of the cars we saw when rolling through the car corral. Nice score! I’ll give you $500 for that GV. Hit me up. I do like those 2WD Blazers! Go back and get me the phone number on that 69 Impala. I want another one. Any info on that hydraulic body lift?